The CEO is driven off the road by the board, after VW hires Kirkland & Ellis, the lawyers that defended BP in the US over Deepwater Horizon. UPDATE Thurs 1pm: The Ex VW CEO Will take a 38m pension pot with him (as well as use of a company car - presumably not a diesel). The head of RnD at Audi, and Porsche's engine chief have also gone. Meanwhile the scandal is spreading, as cars manufactured in Europe are also involved, according to the German government. UPDATE: WEDS 1614: Winterkorn has walked (or been driven off the road, more accurately). Here are some snippets from his resignation statement. 'I am shocked by the events of the past few days. Above all, I am stunned that misconduct on such a scale was possible in the Volkswagen Group. The beleaguered German car maker whose dodgy diesels faked US emissions tests, has apparently retained the US law firm which defended BP over the disastrous Deepwater Horizon oil spill. As portents go, that’s pretty portentous. Lest you need reminding, that particular legal barrage lasted over five years and ended up costing BP a chief executive and no less than $18.7bn (£12.2bn) in fines. What’s left of BP is a chastened shadow of its former self. So Volkswagen’s board and shareholders are clearly anticipating a pretty rocky road ahead. As well they might - not only the famously tenacious EPA but also the New York Attorney General and the Californian Air Resources Board are now lining up to take on the German giant in the US courts. No doubt others will join the queue - the US media is already adding the VW name to the country’s unofficial corporate rogues gallery, alongside such dubious company as Enron, Worldcom and even Bernie Madoff. Meanwhile back in its Wolfsburg HQ, CEO Martin Winterkorn will tonight face a board meeting at which his fate will be decided. Rumours have been rife since yesterday that his departure is imminent, with suggested replacements including Porsche boss Matthias Mueller, and Dieter Hess, who runs the core VW brand. On the face of it his demise would seem almost inevitable - his background as a talented engineer and reputation for always keeping on top of the detail will make it even harder to convince the powers that be that he should stay on. 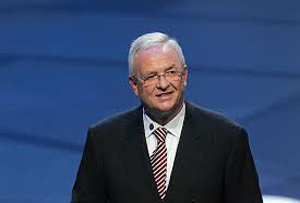 It’s all deeply ironic given that only a month or two ago Winterkorn was quietly celebrating victory in another boardroom battle, having seen off an attack from VW patriarch Ferdinand Piech. But this story, as such scandals do these days, is moving way too fast for any traditional model of corporate governance to keep up with. The company has already seen a whopping 40% fall in its shareprice since Monday and the very board members who must stand in judgement of Winterkorn may turn out to be themselves too tainted to stay on. Quis custodes ipsos custodiet? Only this morning the German government was forced to admit that it knew about the dodgy software back in July, and there are reports that not only cars from stablemates like Skoda, Seat and Audi may be affected but possibly those from other manufacturers as well. With the ripples spreading so far and so quickly, who can say where it will end? One thing is for sure, the €6.5bn (£4.9bn) set aside by VW for costs pertaining to Dieselgate is already looking pitifully inadequate. The partners at Kirkland & Ellis must be licking their lips - Audi A8’s all round please - with petrol engines obviously.